The Admissions feature takes the hassle out of enrolling new students as QuickSchools - the most sought after online school management system (also known as online student information system or SIS) can be used as a school admission software or student admission software as well. From tracking new student inquiries to enrolling students for the next semester, the Admissions feature provides an easy and convenient way to manage the large amount of information required for and produced by the admissions process. With easy to read pages that are completely customizable, student admissions have never been so easy. 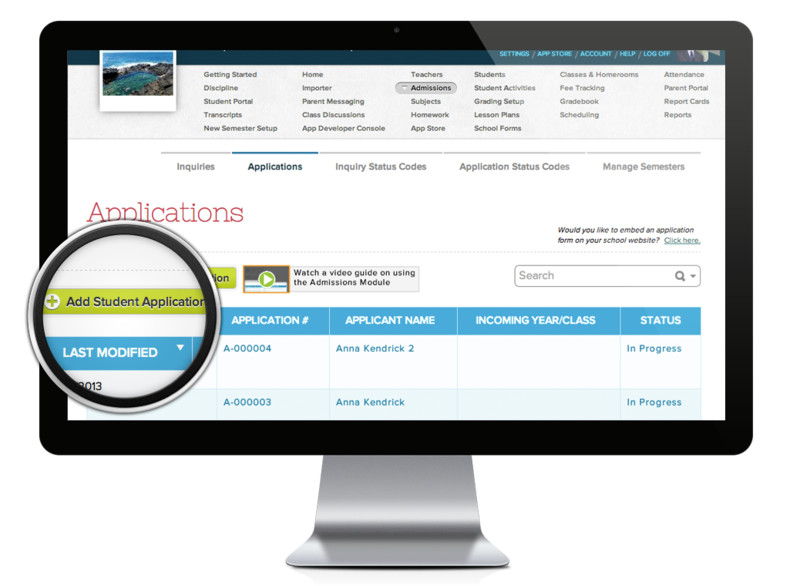 The Admissions feature is actually where the powerful QuickSchools' school management system process begins. Once student information is entered during admissions, it is saved in the school’s QuickSchools' student information system (SIS) database and is available to qualified school staff for as long as the student is enrolled. Teachers, administrators, and departments no longer need to copy or reenter information and needing multiple files for a single student is eliminated. The streamlined admissions process effects all staff in the school making their jobs easier and more efficient by reducing paperwork, errors, and redundant administrative tasks. It is easier than ever to keep track of parent inquiries, school applications, application status, and enrollment. Once information is entered at the inquiry stage, the information is stored in the QuickSchools' student information system (SIS) database. Information is carried forward to other admissions forms, such as the school applications eliminating the need to reenter information. Once the student is enrolled, that information is carried over to the student record, so little information needs to be added making the process very efficient using our school admission software. New semesters and existing semesters can also be defined and modified from the Admissions feature. 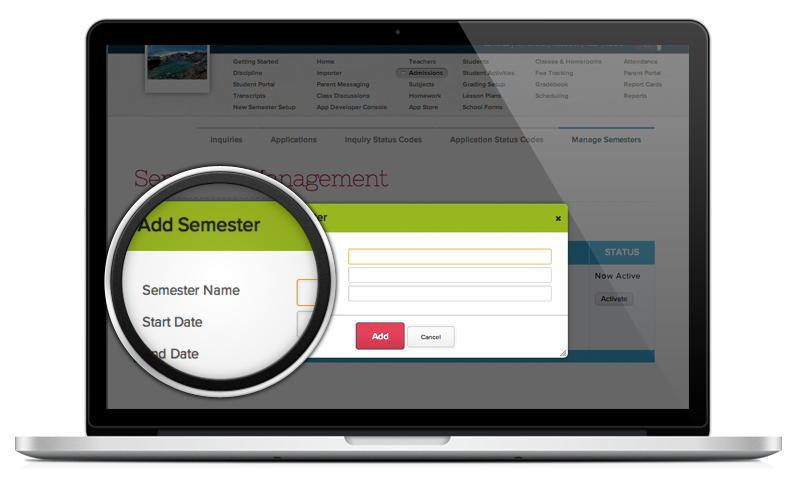 This enables admissions staff to easily see the details of the next semester and enables administration to create and manage new and existing semesters.